Do you get pain while driving? Then these simple changes can make the biggest change in your comfort level. Best of all, they can be used right away. I’ve seen a lot of patients that have long commutes every day. They come in complaining of neck, back and shoulder pain to name a few. Sometimes the best treatments are always the most simple and overlooked. 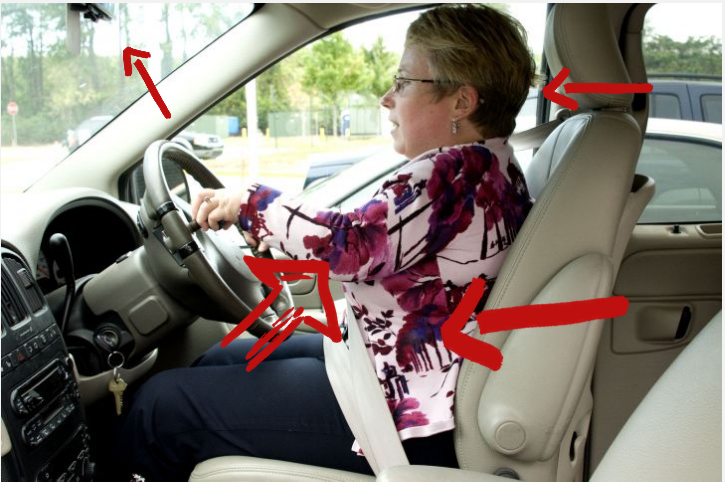 The biggest of them are the effects of bad sitting posture while driving. It’s great to lean back while driving. It feels comfortable. Unfortunately, as your body leans back, it becomes harder to keep both hands on the steering wheel. Your arms begin to straighten out. That puts added pressure on the shoulders since they’re made to work harder to keep your arms up. By keeping the seat nearly 90 degrees, your core muscles will activate more. This allows the right muscles to work so that it ‘stabilizes’ the spine. Ultimately, your muscles won’t be overused. If your seat is reclined back, your head ends up leaning forward. This creates a ‘forward head posture’ that can tighten the muscles in the back of the head. This can eventually lead to tension related headaches. This has several benefits. One is that it provides feedback for your head to be in the right position. If you didn’t have that headrest near the back of your head, you may end up driving with your head forward. And again, this can lead to tension related headaches. The most important advantage occurs if you’re ever rear ended. Research shows that having a high headrest prevents the head from snapping back in a whiplash manner. Take it from someone that’s seen hundreds of patients from car accidents. That raised headrest is the best thing you can do for yourself! I can’t tell you the number of times someone comes in with shoulder or neck pain and expects me to perform some magical exercises. I end up telling them to sit with both hands on the steering wheel and after a few days, their pain disappears! This happens all the time. I’m as guilty as the next person on driving with one hand. However, this position also rotates our body slightly. Our neck is slightly turned and our shoulder is slightly turned. This makes certain muscles tight and others overstretched. Sitting in this position for long periods of time will eventually bring about those aches and pains. Once you bring the seat up, the headrest forward, and have both hands on the steering wheel at a distance that’s comfortable (elbows are slightly bent), reach up and set the rear view mirror from that position. This is the BEST feedback tool you can have while driving. You see, every time your posture or positioning changes, you’ll notice it in the mirror. The angle of the view behind you will not be fully visible. That means you are not sitting in the right position. Do this for a few weeks and you’ll get used to being in the right position. As you can see, it’s not that hard to practice healthy postures while driving. Best of all, they’re simple and easy to do. If you’re someone that commutes long distances while driving and suffer from muscle aches and pains, try these for a few weeks. You won’t regret it. If you continue suffering from muscle aches and pains, you may have muscle trigger points, or what we call muscle knots. To learn more about myofascial trigger points, you can see our beginner’s guide to trigger points. Simply click here. To learn more about how to treat specific trigger point areas, click here to start.